The “feminist” PMO wouldn’t be stupid enough to force female Liberal MPs to publish identical “personal” messages of support, would they? 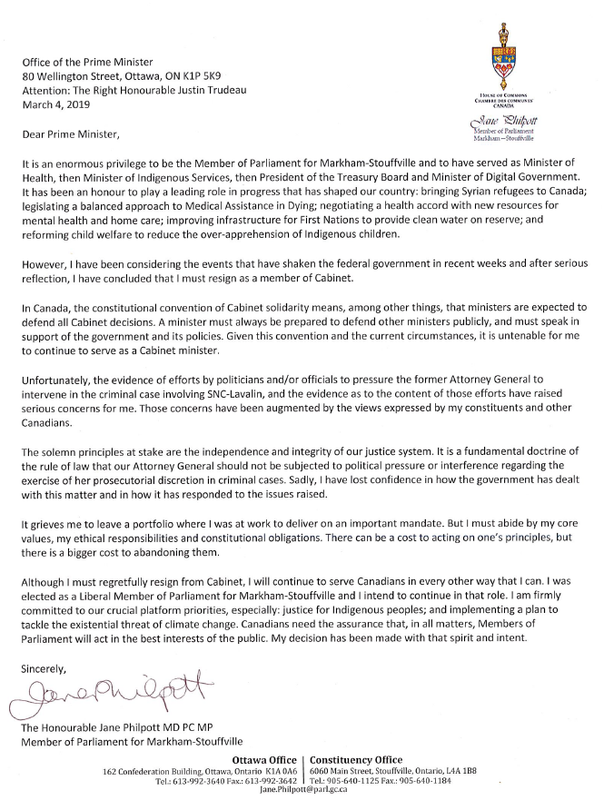 Spotted by my sharp-eyed pal Sean Craig: PMO told female Liberal MPs to post personal messages about what a swell feminist he is – presumably to offset this growing controversy. Except a couple of the MPs just did a cut and paste. Oops! 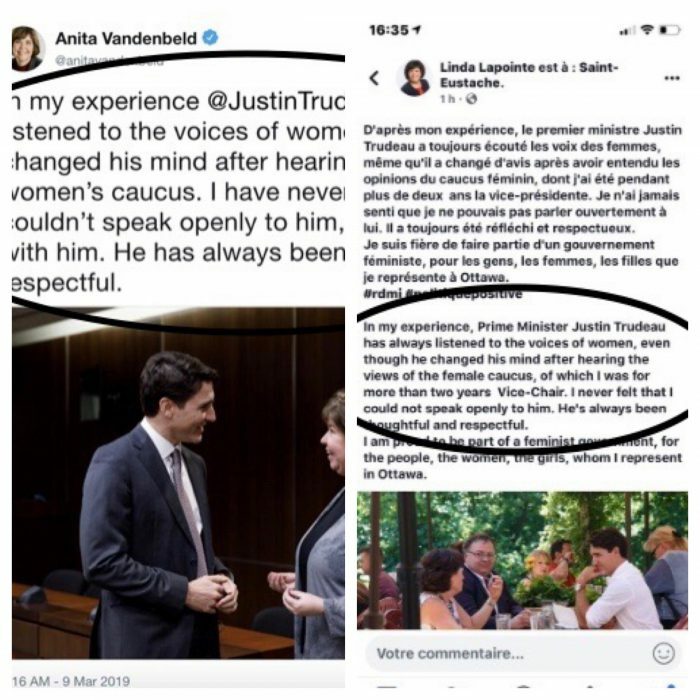 That’s a female Liberal MP talking about Justin Trudeau. I guess he could again say that we should believe women when they come forward. And then he could dismiss them. Again. He’s done that a lot, hasn’t he? Liberal MP Celina Caesar-Chavannes says she was met with hostility and anger from Justin Trudeau when she told him she was leaving politics, prompting her to speak out about the Prime Minister’s behaviour. A source with the Prime Minister’s Office who was not authorized to discuss details on the record said Mr. Trudeau was concerned that her decision would be associated with the SNC-Lavalin affair, but did not raise any concerns about race. Ms. Caesar-Chavannes said she told him that she hoped he could one day understand the impact that political life has had on her family. She said threats to her safety have been made against her in the past. A week later after a caucus meeting, Ms. Caesar-Chavannes said she approached Mr. Trudeau to talk about their last interaction. “I went to him, I said, ‘Look I know our last conversation wasn’t the greatest but …’ And at that point I stopped talking because I realized he was angry,” she said. An hour after the “Prime Minister” speaks, this. This is simply extraordinary. In all my years of lawyering, and trying to teach law, I have never seen something like this. 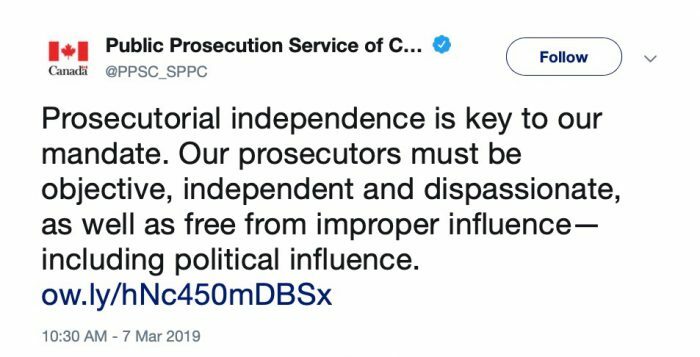 It is the clearest indication, yet, what the Canadian justice system thinks about Justin Trudeau’s repeated efforts to obstruct justice. The prosectors are directly responding to Trudeau’s claims this morning. If the rule of law is to truly matter – if we are to avoid being regarded, internationally, as a banana republic with a judicial system that is wholly a captive of of the executive branch – we must investigate, and prosecute, the wrongdoers. And that, increasingly, looks to include Justin Trudeau. 1. He didn’t apologize. After Trudeau’s office leaked that the beleaguered Liberal leader was deliberating about an apology for the SNC-Lavalin scandal, we all kind of expected one. We didn’t get one. And when Trudeau was asked why, he blinked and stammered and looked offended. Dumb. Apologies cost nothing, Petit Justin. But if done right, they pay many dividends. 2. He didn’t take responsibility. Even if you don’t apologize – even if you don’t express the smallest amount of regret, which Trudeau didn’t do either – it’s important that you accept that the proverbial buck stops with you. Trudeau (again) said that it’s all Jody Wilson-Raybould’s fault. “She didn’t come to me,” he wheezed. Well, actually, she did. You just wouldn’t listen. 3. He didn’t sound sincere. Justin Trudeau’s greatest strength is his acting ability. He is an expert at radiating wet-eyed sincerity and emotion – kind of like our Labrador retrievers, when we come home and discover they’ve eaten an entire living room sofa. At his press conference, Trudeau had all the conviction of an ISIS hostage reading a statement prepared by his captors. This was a truly historic moment, and Trudeau needed to convince us. He didn’t. I’ll be on CTV Your Morning today around 7, after Trudeau speaks this morning, and also doing the radio tying over on the mighty Newstalk 1010. This is the sort of thing I’ll be talking about: it didn’t go well, yesterday. At all. 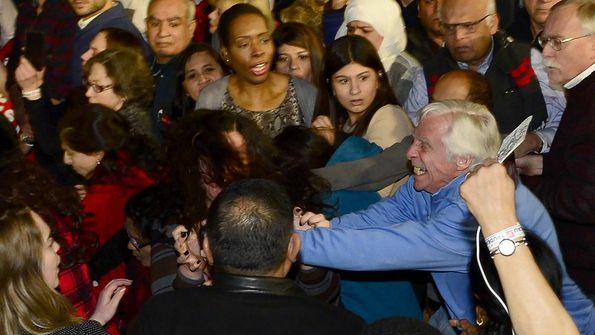 Above: a Trudeau supporter physically attacks a protestor at Justin Trudeau’s rally in Toronto last night. Where – I’m not making this up! – they played Michael Jackson songs – on the same night ‘Leaving Neverland’ was airing. And the great reviews keep rolling in! I fundraised for her, before she was elected. I have remained friends with her since. And I am so, so proud of her today. This government is falling apart before our eyes.